A recent summer weekend is smoldering in my memory. 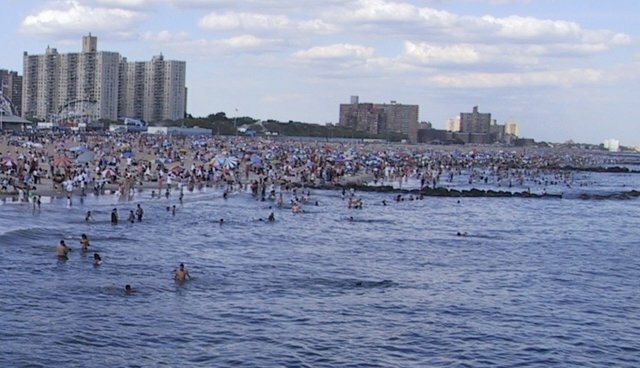 My favorite New York beach was checkered in rows of splayed out towels by the time I had caught the bus to the train and crossed the nebulous line where gravel turns to sand. I was digging the sunblock from underneath my nails after a heavy slathering session when the beach's buzz level of crashing waves, music and chit chat rose in volume. The heightened voices were coming from the water's edge, where over a dozen parents and children had gathered in a tightly packed circle, their hands jammed toward the sky, gripping cell phones and snapping photos. I continued picking my nails, assuming it was another piece of trash mistaken for an animal; a plastic straw confused for a crab leg or glass shard misidentified as a jellyfish. The commotion continued, and curiosity got the best of me. I nonchalantly weaved between the blankets, just so happening to meander in the direction of the crowd. I leered over the hairy backs and damp towels flung around necks to see a man clutching a baby shark by its tail. He was grinning, delivering a thumbs up to his wife. "Angle it a bit more in front- no babe, in front of you," his wife directed. "Yeah. No, you're blocking it. In front of you." The man jolted the shark by his tail, front and back, left and right. "Like this?" The shark wiggled his torso and gaped his mouth open and shut. A boy grabbed at the shark. "Let me hold it! I want a photo." The man maintained a grip on the tail. The boy squirmed up next to the shark, smacked a hand on his side in a declaration of ownership, and extended his other hand gripping an iPhone to snap a selfie. "Shouldn't you put the shark back in the water?" I asked. My voice was swallowed in the murmurs of excitement. I asked louder, "Shouldn't you put it back?" Panic arose from the circle. "No, I didn't get a photo with it yet!" "It's my turn first!" A group of kids and adults alike began more desperately clambering for a grip of the shark. A big man with thick muscles and deeply tanned skin won the grab-off with two hands on the animal. "Joey! Hey Joey take my picture!" he shouted to a friend. The shark's torso stopped wiggling, and he slowly gaped his mouth once, and then let it hang open. "You guys! I think the shark is dying," I exclaimed. A few heads turned my way, then returned back to taking photos. My cheeks began to burn as I stood in front of the man, my hands waving, blocking the cameras. "This shark is dying. You guys are literally killing this shark for a photo, can't you see that?" I asked. A sea of cameras, iPhones and iPads stared back at me. The crowd waited for me to move so they could resume their important work of proving they saw a shark. Dead or alive, it didn't matter. It'd be liked on Facebook and Instagram either way. I clamped my shaky hand on the thick muscled man's greasy shoulder. "Let it go," I declared in a voice higher than I knew I was capable of. He turned to his friend. "You get the pic, Joey?" and upon Joey's nod, he shrugged. "Fine." "No, wait!" Another man yelled, grabbing at the shark. "I didn't get a turn!" "You are literally going to kill this shark for a photo!" I argued. He looked down at the shark dangling from his hand. "It's already dead," he shrugged. The shark's mouth lay agape, his gills slightly blowing in the sea breeze. "Just..." I bit down hard on my tongue to force back tears worming their way out. "...Just put him back in the water. Please." The man shrugged and dropped him in the sea. Another man waded into the water to find him, but the shark had floated out with the current. A little girl in a polka dot bathing suit with ruffles stomped up to me, splashing her little feet through the water. She smacked her hands onto her hips. "What'd you do that for?! I don't want any shark stinking up my ocean." I stared at her, and shook my head. "That's nature." She blinked at me, confused by this notion, and stomped away. This is a generation that experiences animals, nature and the great wonders of our world behind the safety of four-inch screens instead of understanding how to live among them in reality. We are teetering dangerously close to preferring satisfaction in the virtual world over the real one. Humans no longer know how to interact with the natural world. That summer day, this disconnect came at the sacrifice of a little baby shark. I fear the consequences will be more dire in the future.